Free to Sand Dollar Guests! For many years, Sand Dollar and Bonaire Dive & Adventure have actively supported education and conservation programs designed to contribute to the preservation of Bonaire’s magnificent underwater Marine Park. Join them this summer as they team up once more with Fish ID experts Patti & Scott Chandler of ReefNet, Inc.
Well known for their work in marine life identification and documentation, the Chandlers have spent the last 20 years documenting fish species, behaviors and creatures for future study and identification. Participants can join in for the entire week’s program or join in “ad hoc” on as many events and seminars as they like in accordance with their own personal preferences. 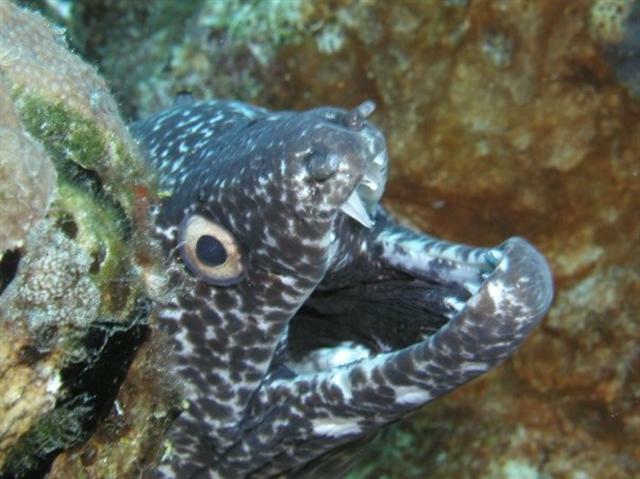 9.30 am: Bonaire Marine Park Orientation and check out dive on Bari Reef. During the orientation all will be explained about the Fish ID Challenge. 8.30 – 9.00 am: Daily Wanted Poster unveiled under the big umbrella at Bonaire Dive & Adventure. Scott & Patti are available for questions. 9.00 am: Guided dive with naturalists Scott & Patti Chandler on Bari Reef after an explanatory briefing. 5.00 – 6.00 pm: Bonaire Dive & Adventure’s Dive Masters Rum Punch Party under the big umbrella with music & snacks. 7.00 – 8.00 pm: Fish Tales and Raw Video Review with Scott & Patti. 2.00 pm: Guided dive with naturalists Scott & Patti Chandler on Bari reef after an explanatory briefing. 7.00 – 8.15 pm: Second Multimedia Fish ID Seminar. 2.00 pm: Guided dive with naturalists Scott & Patti on Bari reef after an explanatory briefing. Scott & Patti will be available for questions. 9.00 am: Guided dive with the naturalists Scott & Patti on Bari Reef after an explanatory briefing. 5.00 pm: Award Ceremony under the big umbrella at Bonaire Dive & Adventure with drinks and snacks. This entry was posted on March 29, 2011 at 10:23 pm and is filed under Diving and Snorkeling. You can follow any responses to this entry through the RSS 2.0 feed. You can leave a response, or trackback from your own site.